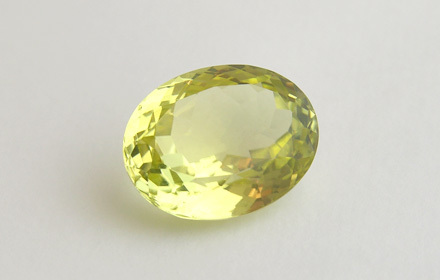 Weight: 3.74 ct; size: 10.77 | 8.76 | 5.47 mm; shape: oval; colour: medium light yellow; strong; clarity: eye clean; cut: good; treatment: none. Very clean specimen; good mixed style cut with large window. Source: David Weinberg, Multicolour Gems Ltd. In metamorphic schists, gneisses; more rarely in pegmatites (Anthony et al., 2001—2005).